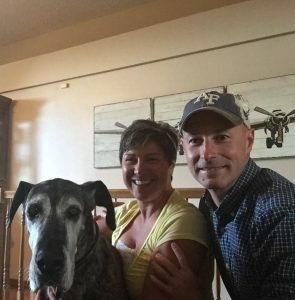 Maya has a home - Rocky Mountain Great Dane Rescue, Inc.
Maya has a home with her foster family in Colorado Springs, CO. Kim and Reggie came to learn about RMGDRI at a public appearance. Neither have owned a Great Dane, but have been around mastiffs growing up and were excited of the opportunity to foster and adopt. Miss Maya has had a rough go of it since coming into rescue and the family has been by her side through her scares and surgeries to remove her cancer. At the moment this sweet girl is cancer free and will live her glory years out with undivided attention of a family who couldn’t bare to see her leave their home. Way to go Maya!